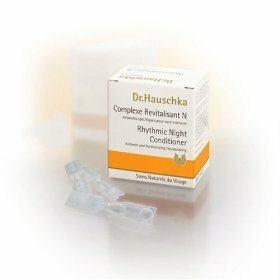 This overnight treatment renews and regulates all the functions of the skin, resulting in a revitalized complexion. Amazingly, it mirrors and supports the skin's 28-day cycle of renewal. Stimulates healthy circulation, bringing vitality, life and color to the skin. Strengthens connective tissue and balances oiliness. Rhythmitized dilutions of white lily, anthyllis and rose petal extract combine with rose essential oil to restore harmony. Ideal for times of transition, seasonal change, travel or stress.